The Legacy Circle at Mercy was established in 2013 as a way for Bakersfield’s emerging leaders to continue the legacy of giving that began more than 100 years ago when Mercy Hospital was founded. Legacy Circle Members meet three times during the year with a dinner and program. Interactive presentations with physicians, behind the scenes hospital tours, and interaction with hospital leadership are all perks of joining this special group. Since this is a philanthropic club, members are asked to contribute $500 each year. 100% of this membership gift goes directly to the project chosen to be funded in September. 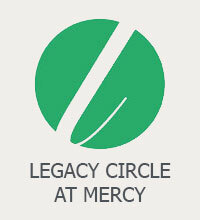 Join the Legacy Circle at Mercy and be part of Bakersfield’s new generation of philanthropists. You can pay via credit card by clicking “Donate Now” or send in your donation of $500 to the Friends of Mercy Foundation at PO Box 119, Bakersfield, CA 93302. You may also contact Samantha.Cardenas@dignityhealth.org or call 661.663.6700. An advanced perinatal ultrasound for the Family Birth Center at Mercy Southwest. This unit will provide high definition imagery for the diagnosis and treatment of conditions for patients suffering from complicated or high-risk pregnancies. The purchase of a TCO2 Monitor for the NICU and sleeper chairs for the Family Birth Center. This new monitor will measure the oxygen and carbon dioxide levels through a probe that is placed on the baby’s skin rather than having to continuously draw blood samples through the heel. The sleeper chairs will bring comfort to visitors in our Family Birth Center. Two glider chairs and two Neoblue Blanket LED Phototherapy Systems for the NICU at Mercy Hospital Southwest. These gliders include an ergonomic design for feeding, while the blankets provide ultraviolet light therapy to infants suffering from jaundice. A Pediatric Project - Broselow carts and iPads . The Broselow carts allow caregivers to very quickly and accurately administer medication and lifesaving procedures to pediatric patients. Additionally, the funding purchased iPads that will be used to help distract our pediatric patients from what can oftentimes be a painful and most certainly “scary” experience. Two AccuVein AV400 Vein Finders. These devices allow for easier access to veins when patients need an IV insertion. Many patients including children, the elderly and those suffering from chronic diseases typically require multiple sticks, which is a painful experience. The new Vein Finder devices allow caregivers to find the vein immediately, avoiding the oftentimes painful and stressful experience. Adam Belter Michael Hansen Farhan Shah,M.D. Chad Brock Sofie Hay,Ph.D. Katherine Thomas,M.D.